UPDATE: The Iowa DCI has confirmed the suspected sighting in Missouri was not Mollie Tibbetts. Police in western Missouri confirm they responded to a possible sighting of Mollie Tibbetts last week. The 20-year-old University of Iowa student vanished on July 18 in her hometown of Brooklyn, in Poweshiek County. 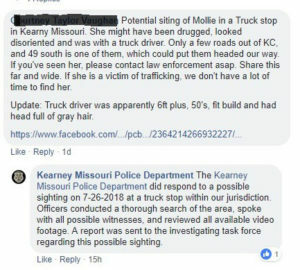 Police in Kearney, Missouri say they responded to a possible sighting of Tibbetts at a truck stop on July 26. Officers searched the area, spoke with witnesses, and reviewed video footage. Kevin Winker, with the Iowa Department of Public Safety, told reporters on Tuesday that investigators are following all leads, but he declined to speculate if Tibbetts may’ve been abducted. A Facebook post about the possible sighting of Tibbetts claimed she “might have been drugged, looked disoriented and was with a truck driver.” There’s no word from the Iowa Division of Criminal Investigation if authorities believe the tip was legitimate.